Easter would be a sad tale if it ended with Christ’s disciples laying his body in a borrowed tomb. We know the story does not end there. We celebrate today because He left that tomb. He walked away from death, defeating sin and the grave. He rose again…just as He said. It was no accident. It was part of the plan…the plan to redeem us from our sins. To bring us–hopeless sinners–into a relationship with Himself–a holy God. God did not simply save us from something; He also saved us to something. He saved us to eternal life with Him. He saved us to abundant life in Him. Today we make special pause to celebrate God’s amazing gift of grace. We realize again the price that was paid so we could live eternally with, and abundantly for, Him. 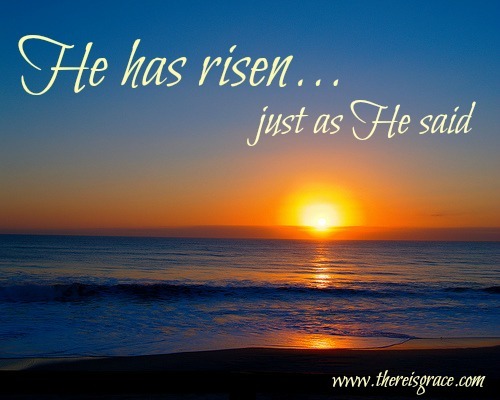 We rejoice in the fact that we serve a risen Savior. Are you celebrating today? Do you rejoice in the fact that you have eternal life with Christ? Are you living abundant life in Him?